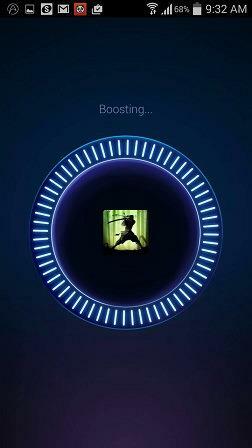 DU Speed Booster: Does It Add Efficiency to Your Droid? 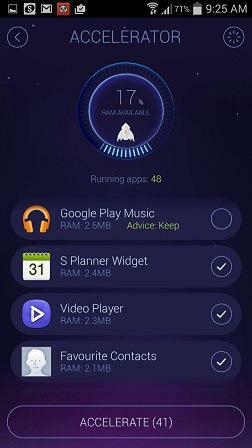 DU Speed Booster: A complete Android one-touch optimizer and cleaner with a built-in antivirus security. It can boost the speed of your phone by 60% and speed up gaming by 20%. For those who have used an Android device for a while, it's a common complaint that performance gets somewhat clunky and sluggish after a while. This is usually because like the digital shadows we leave for the NSA's PRISM program to pick up on, all the apps and software that we download tend to leave traces we don't know about. These traces build up like grease and gunk and unless you clear them from time to time, they can combine with other factors and slow down gaming, apps and generally junk up your phone and SD card. Temp files, unnecessary background processes and services that many programs have running on your phone can get a big bite out of your resources. The first thing that caught my eye when I began using the app was the good-looking minimalist GUI. 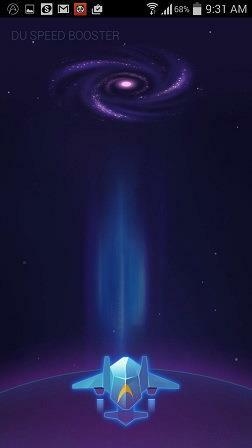 It's a space-themed, attractive blue and purple UI and an animated floating icon on the desktop. When the dashboard loads, it scans through the phone and gives it a score out of 100 based on overall performance calculation. 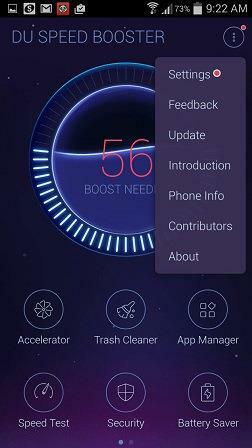 If the score is in the red (or yellow) and the app recommends 'Boost Needed', then you can go ahead to the several clean-up/performance boost options: Accelerator, Trash Cleaner, App Manager and Battery Saver. 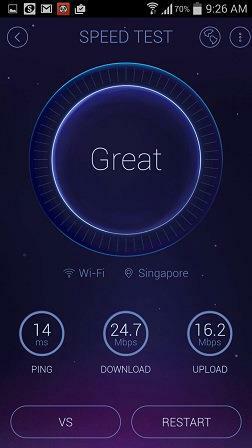 The additional network Speed Test and Security features are a bonus. 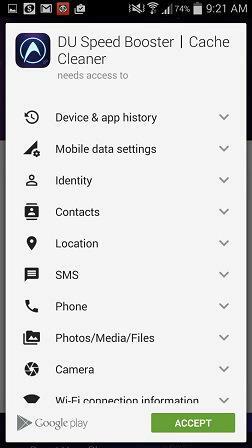 Before exploring each features of the app, it's a good idea to check out the Settings area. From the Settings area, you can make changes to the way you want to use the app. 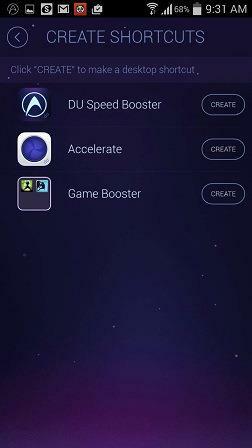 You can create useful shortcuts on your home screen for the DU Speed Booster, Accelerator and Game Booster. When running a game for instance, tapping the Game Booster shortcut will quickly optimize your graphics performance to improve gaming experiences. 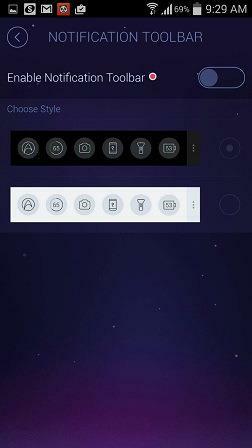 You can also add a Quick Switch to your home screen to access quick 'Boost'. 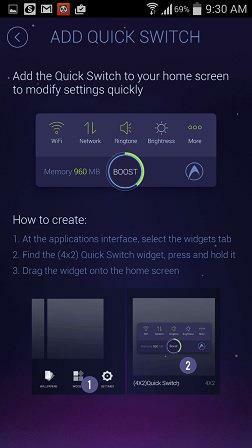 The Float Window widget lets you accelerate your smartphone with a single tap, and also offers convenient access to other shortcuts such as GPS switches, Bluetooth etc. The Notifications toolbar seems to have a new format from older versions of the app. There is a black and a white version of the toolbar, that notifies me about the activities going on in the background of my Droid – app updates, service notifications, e-mail updates etc. This is a very handy tool that gives a clear idea of how the phone's resources are being used. The toolbar also gives me quick access to other shortcuts, which is a bonus. The app's main dashboard can be swiped to the right to reveal the Game Booster, which is designed to improve graphics processing for gamers who want to enjoy smoother gaming and perhaps even see an fps boost. Activating the Game Booster screen signals the app to scan automatically for games on your system, and then you can choose to boost specific games. I don't use my smartphone much for games so I haven't had a chance yet to test gaming performance, but the app promises to concentrate the phone's resources to increase game speed by 20 percent. As mentioned earlier, the Game Booster is also accessible directly from a shortcut on the homescreen. The Accelerator diagnoses the phone with a single touch, tells me how much RAM is available, and offers suggestions of processes and apps that may be unnecessary but are eating into the RAM. I can let it shut these down for me. 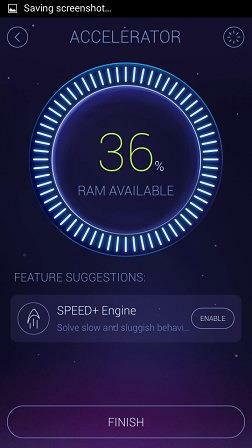 Tapping 'Accelerate' allowed me to go from 17 percent available RAM to 36 percent RAM, which is impressive. The app also advises on the processes I should leave well alone, and I can un-check the processes I want to keep running. The Trash Cleaner cleans up the memory, cache, system trash, the SD card, log files, empty folders etc. to free up even more memory. It promises to clean up an average of 350 MB junk. The results of cleanups on my phone were quite impressive. 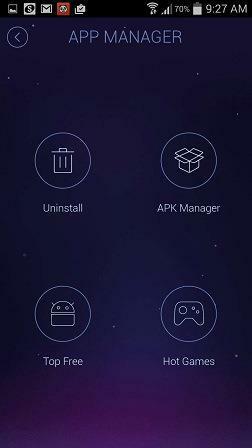 The App Manager lets you directly uninstall apps and manage your apps from one place. You can see how much memory space each application and system program is using, and send them into the trash bin to clear up space. DU Security protects my phone against security risks that mobile phones are vulnerable to. 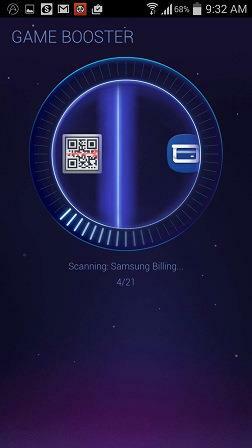 The Antivirus lets you scan for viruses. 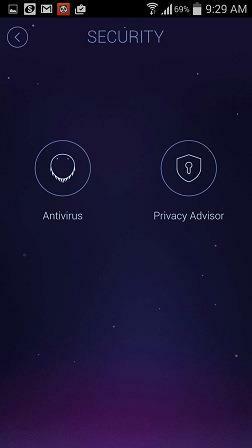 The Privacy Advisor lets me control the information that other apps can access on my phone. It may seem ironic, considering how much access the DU Speed Booster itself has, but it's useful to know what other apps can access. This is another useful feature that lets you test your WiFi and network speeds without having to download an extra app for the purpose. I discovered that my WiFi was running at a less-than-promised broadband speed with the help of this feature. 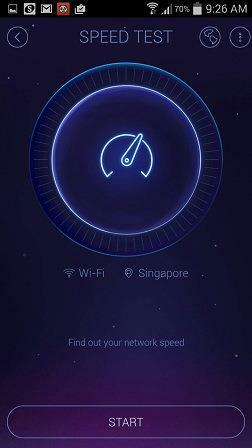 There's also a VS feature in which I can compare my network speed with that of other countries. It's not particularly useful in any way I can think of, except for a little geeky fun. 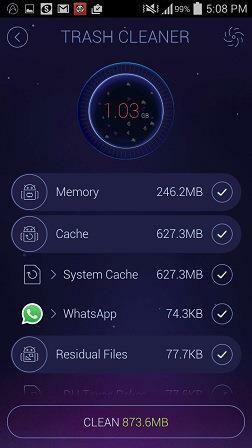 Another DU app to save battery usage is useful to complement the effect of the Speed Booster for overall performance. 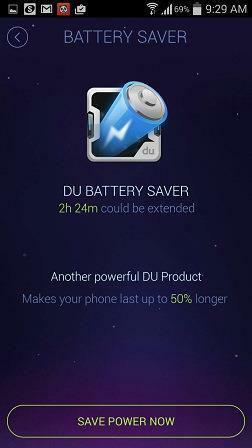 I've used the DU BatterySaver app and it's quite effective in telling you how long your battery will last, and how you can optimize your phone's resources to prolong battery life by a few minutes to a few hours, depending on how aggressive the settings are. 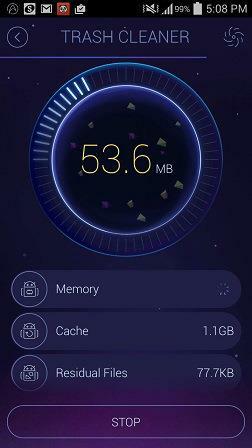 Some people may have an issue with the task killer always running in the background and having the phone sacrifice some RAM and CPU to the app itself. But that is the issue with all task-killers programs. I personally think it's a small price to pay for the many features the Speed Booster offers. 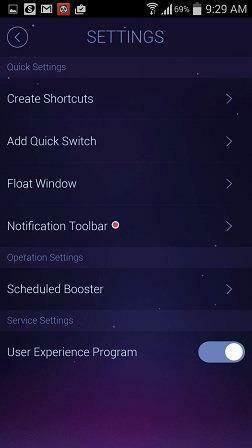 I like being notified of the activity on my smartphone through the Notifications toolbar, the one-tap cache clearing capability and the ability to easily shut down unwanted processes. The fact that you can do several things in a single place – no need to download separate batterysaving, security and Ookla speed testing apps – all for free is a big advantage in my book. 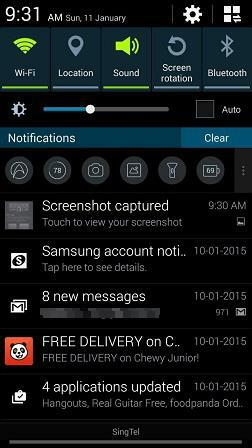 It is no wonder that the app has more downloads – over 100 million – than most others of its kind.